This is a rare opportunity for you to test drive a Subaru, as well as see Russ Swift for free! Russ Swift is no stranger to car enthusiasts. The Guinness World record holder and legendary stunt driver is famous for his reverse parallel parking in the tightest space, the fastest doughnuts, among other breathtaking stunts. However, for you to see his performance, one has to attend the annual Manila International Auto Show, a venue where he, alongside Subaru, chooses to display his world-famous stunts. Cebuanos are in for a treat, because Motor Image Pilipinas, Inc., the exclusive distributor of Subaru vehicles in the Philippines, is staging an action packed weekend this coming August 24 to 26 as world-renowned precision stunt driver Russ Swift performs for the first time in the Queen City of the South alongside the final leg of the 2018 Subaru Ultimate Test Drive. Taking place at the North Open Parking of SM City Cebu, locals get to experience for themselves Subaru’s signature Symmetrical All-Wheel Drive (SAWD), Boxer Engine, Subaru Global Platform and the new EyeSight Driver Assist Technology. Cebuanos are given the chance to be at the driver’s seat to feel first-hand how these four Core Technologies make all the difference. Pre-register today at https://subaru.asia/ultimatetestdrive and be one of the first 100 who will get a special gift from Subaru on-site at the test drive area. At the same time, locals will also be able witness the capabilities of Subaru vehicles at the hands of Guinness World record holder and legendary stunt driver Russ Swift. Be amazed with his reverse parallel parking in the tightest space, the fastest doughnuts, among other breathtaking stunts, as he debuts in the Visayas region. Cebuanos are in for an adrenaline filled show and will also be treated to a photo-op and autograph session with Russ Swift himself after each show. Don’t miss this chance to see and feel the thrill of driving a Subaru. 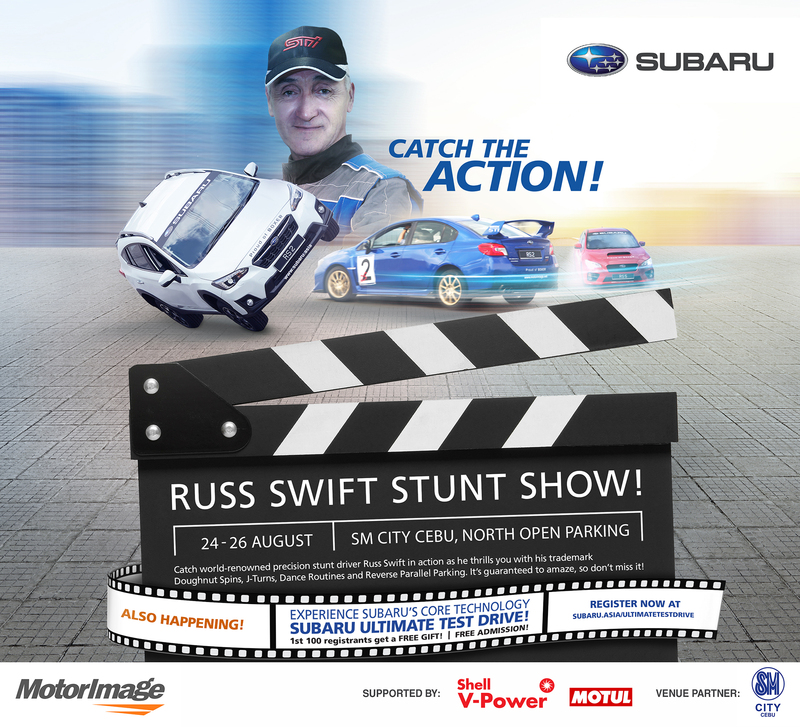 Bring the whole family to catch double the action with the Subaru Ultimate Test Drive and Russ Swift Stunt Show. Whereas Russ Swift’s stunt show is an additional fee if one wishes to see his performance during the Manila International Auto Show, Cebuanos are in for an exclusive treat, as his performance will be offered all for FREE!